Participants will review the rich suite of methods available on mean length data and then using the MLZ package in R, they will be able to interpret the results. In the first part of the workshop, we review the rich suite of methods now available based on mean length data. These include the estimators that assume equilibrium (Beverton-Holt, Ehrhardt-Ault, length-converted catch curve), and non-equilibrium estimators (Gedamke-Hoenig, Then et al., Huynh et al.). In the second part of the workshop, we show participants how to fit the models using the MLZ package in R (available through CRAN online) and how to interpret the results. Participants are encouraged to bring a computer with R, RStudio and the package MLZ installed so they can try using the MLZ package. 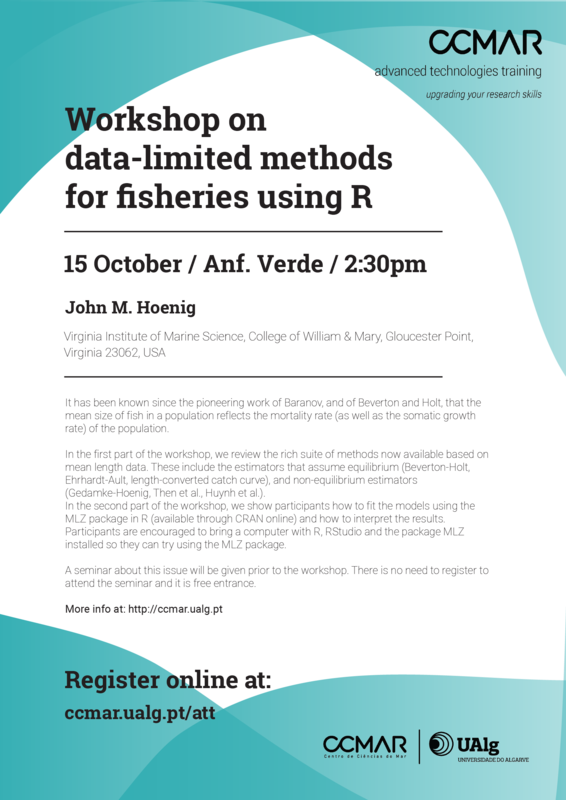 Fisheries background, able to use R, must attend the CCMAR seminar (info here).